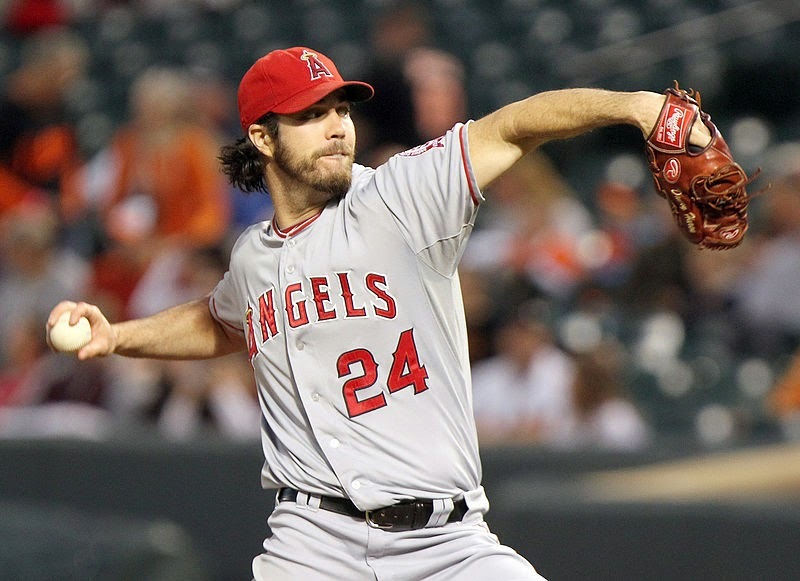 Dodgers pitcher Dan Haren is a Los Angeles-area product who formerly pitched for the Angels. Haren returned to the Big A Wednesday night and shut down the Angels, helping the Dodgers to a 2-1 win and securing, for the time being, his place in the city team's starting rotation. Pitching for the Dodgers, Dan Haren returned to his old haunts at Angel Stadium Wednesday night and actually looked something like this (Keith Allison/Creative Commons Attribution-Share Alike 2.0 Generic license). The Los Angeles area produces more Major League Baseball Players than any other region in the world. That's not a bulletin, of course. The population base is enormous and the weather is great. A quick look at the player biographies on baseball-reference.com reveals that 185 players who have appeared in big league games this year were born in California, many more than any other state. Of those, 107 are natives of the Los Angeles area, which we're counting here as all of Los Angeles and Orange Counties, plus nearby portions of San Bernadino and Riverside Counties. If we throw in three guys from Bakersfield, which is 100 miles out in Kern County, it becomes 110. By comparison, the entire fertile state of Texas has 100 natives who have appeared this season in the major leagues, and the entire state of Florida has 79 players. So, the Los Angeles area is king when it comes to producing big league players, hands down. Watch the Dodgers games on television (if you can) and Vin Scully is constantly pointing out that some player is a local kid. Anyway, Los Angeles is where it's at for generating Major League Baseball's players. And, still, we seldom see an event quite like what happened Wednesday night at Angel Stadium. Then and there, we saw a Los Angeles player who has pitched for both Los Angeles clubs throw a nice game for one against the other. It was 33-year-old Dan Haren, born in Monterey Park, a player on the back end of his career (he turns 34 on Sept. 17), taking a two-hitter into the eighth inning for the Dodgers, who produced a 2-1 win against the Angels. Haren finished the game with no walks in 7 1/3 innings, allowing only three hits. He threw 87 pitches, 57 of them for strikes. Haren left the game after Erick Aybar scratched out a bunt single with one out in the eighth. Dodgers relievers J.P. Howell and Brandon League couldn't keep Aybar from scoring, so there was that blemish. But so what? It remains a huge night for Haren, who blew up a 10.03 ERA and an 0-5 record in his most recent five starts. This time, the Angels couldn't touch him for most of the night. He took a perfect game into the sixth inning, when Hank Conger, a former battery mate with the Angels, reached him for a single. Haren has pitched well throughout his career at Angel Stadium, where he is 20-18 with a lifetime ERA of 3.20 in 46 games (45 starts). It's a bit of a different story for him lifetime at Dodger Stadium, where he is 6-6 with a 3.80 ERA in 18 games, all starts. At Dodger Stadium this year, Haren is 4-3 with a 4.05 ERA in 10 games, all starts. Of course, Haren was in a different phase of his career when he took most of those starts at Angel Stadium. He was a premium guy then, good enough that the Angels traded Patrick Corbin, Joe Saunders, Tyler Skaggs and Rafael Rodriguez to get him from the Arizona Diamondbacks at the non-waiver trading deadline in 2010. Haren did what the Angels brought him in to do for the rest of that season, going only 5-4 but with an ERA of 2.87 and a pitching WAR of 2.7 in just those 14 starts. It wasn't actually Haren's fault that the trade blew up on the Angels. Entering games of July 25 that year, the day they made the trade, they were 52-48, second place in the American League West and six games behind the Texas Rangers. They were trying to make a move. But they immediately lost four straight and eight of their next 10 to fall 10 games behind. They just shut down offensively. From the day of the trade to the end of the season, the team fashioned a long slash of .234/.297/.370/.666 as it went 28-34. The Angels finished 80-82, 10 games down. Haren also was terrific for the Angels in 2011, finishing 16-10 with a 3.17 ERA and 4.3 WAR in 238 1/3 innings to finish seventh in the AL's Cy Young voting. Again, though, the Angels didn't have it offensively, finishing 10th in the league with 667 runs scored. They finished a distant second, 86-76. Haren hit the age of 31 in 2012 and we began to see his decline. Back troubles started getting the better of him as he finished 12-13 with a 4.33 ERA and a WAR of minus-0.4. His contract expired and he went to the Washington Nationals in 2013. As he struggled there, Corbin made the NL All-Star team for Arizona with a 14-8, 3.41 performance, and some commenced with the easy second guess about whether the Angels should have made that trade. But events in baseball have a way of working around. Corbin is out for the 2014 season after Tommy John surgery on his left elbow in spring training. The Angels brought Skaggs back in the winter deal that sent Mark Trumbo to Arizona, and the young left-hander, injured now, has been pretty solid as No. 5 starters go. Haren signed a deal last winter with the Dodgers, sealing his return to Los Angeles. But the 2014 season has not been an easy ride for the aging right-hander, either. Through last week's games, Haren was 8-9 with a 4.71 ERA in 22 starts. He actually looked like a nice add through May, his first 11 starts, which added up to 68 2/3 innings, a 5-3 record and a 3.28 ERA. But his next 11 starts put all that to question – 3-6, a 6.52 ERA and 14 homers allowed in 58 innings. In the last seven of those starts, he lasted more than five innings only twice. Everyone knew his spot in the starting rotation was in peril. And then, on Wednesday night, Haren reappeared at Angel Stadium, had the Angels eating out of his hand and reclaimed, for the time being, his tenuous spot in the Dodgers rotation. Haren pitched high school ball at Bishop Amat in La Puente, graduating in 1998. He went up the coast for college at Pepperdine, from which the St. Louis Cardinals selected him in the second round of the 2001 June draft. The Cardinals brought him up in 2003 and bounced him up and down for a couple of years, but he was good enough to make all of their postseason rosters as the Cardinals went to the 2004 World Series, which they lost to the Boston Red Sox. That winter, the Cardinals traded Haren, Daric Barton and Kiko Calero to the Oakland Athletics for Mark Mulder. Haren flourished with the Athletics – 43-34 with a 3.64 ERA and 11.4 WAR in 102 starts over three seasons. Being a good player who was getting into arbitration at that point, Haren became too expensive for the Athletics and they dealt him to the Diamondbacks in an eight-player deal that sent six players to Oakland. Though everyone should agree that Oakland general manager Billy Beane has done a fine job with limited resources, we can't say he ended up with much from that deal. The best player he got back was Carlos Gonzalez, who he packaged with Huston Street and Greg Smith (another player from the large trade) a year later to acquire Matt Holliday from the Colorado Rockies. Gonzalez and Street have gone on to become All-Stars. The A's basically rented Holliday for 93 games before flipping the impending free agent to the Cardinals for three players who will amount to nothing. Meantime, Haren pitched All-Star seasons for the Diamondbacks in 2008 and 2009, a combined 30-18 with a 3.23 ERA and 12.6 WAR in 66 starts. That's why the Angels were willing to pay high for him in the middle of 2010, his age 29 season. Wednesday night, the Angels and their fans saw the guy for whom they traded way back then. The Dodgers saw a guy who is hanging on to his career at age 33, and making a serious bid to do so. If Wednesday night is an indication, Haren will hang on for a bit longer. He vests for 2015 with the Dodgers at $10 million if he pitches 180 innings this season. Wednesday's performance brings him up to 134 innings, meaning he needs just another 46 innings. With the Dodgers trying to maintain a 2 1/2 game lead on the San Francisco Giants in the National League West, they will not bench that kind of production just to save $10 million next year. It remains for Haren to keep producing it, or something enough like it. Editor's note: All advanced statistics in this piece are from or are extrapolated from Baseball-Reference.com.